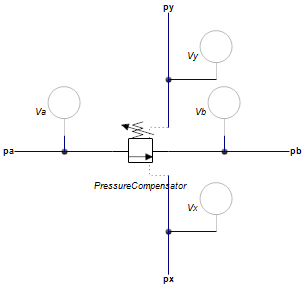 A pressure compensator is an component that maintains a constant differential pressure across it sensing ports px and py by regulating the flow through the component from port pa to port pb. A pressure compensator can be used to maintain a constant flow over a valve by keeping the pressure drop over the valve constant. The sensing ports py and px are then connected with the input and output of the valve. The opening is at its maximum value when the differential pressure across it sensing ports px and py is below the pressure ((k-1)/k)*p_set. If the differential pressure across it sensing ports px and py is too high, the opening is closed. In between it varies between fully open and fully closed. 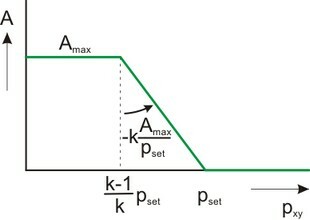 The speed of response of the components is determined by the proportional gain k (typical choose k = 2 to 5). The proportional gain determines the slope of the valve opening. If k is large the regulator will respond quickly but also induce oscillations in the circuit. The valve is implemented with second order spool dynamics. I.e. the spool opening is characterized by the bandwidth (f) and damping (d). Input and output terminals of the component. Sensing terminals of the component. These are used to measure the pressure and have almost zero flow. Conductance of the laminar leakage flows [m3/s.Pa], GLeak >= 0. Discharge coefficient , Cd > 0.